Until recently, spinel was an underappreciated gem with little consumer recognition. 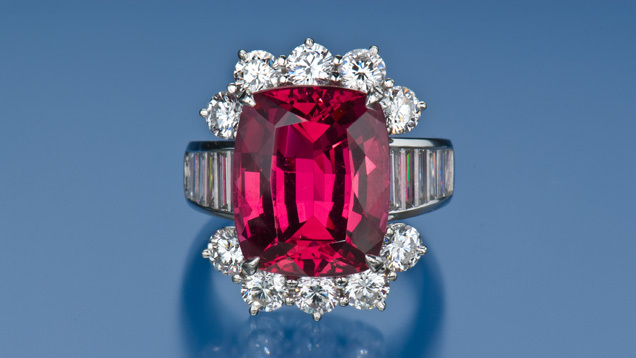 Increasing demand for ruby alternatives rekindled appreciation for spinel’s rich red color and history. In ancient times, southeast Asia’s mines yielded exceptional large spinel crystals, which became the treasured property of kings and emperors, often passing through many hands as spoils of war. Spinel, like garnet and diamond, is singly refractive, with the same physical properties in all crystal directions. It belongs to the cubic crystal system, and its characteristic crystal shape is an octahedron, which looks like two back-to-back pyramids. Well-formed spinel crystals are fairly common in nature. Spinel can also form flattened crystals that look radically different from octahedral crystals. The flattened shape occurs when the pyramids that form an octahedron rotate against each other during growth. 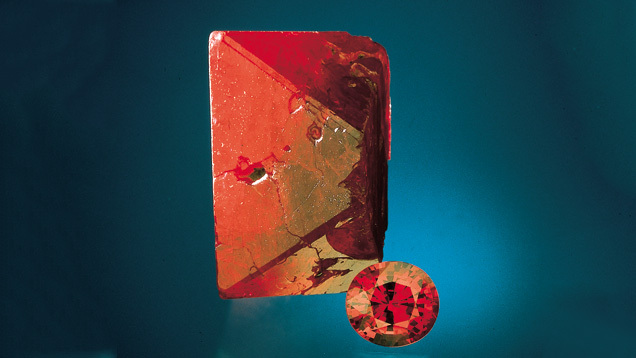 Scientists describe this as a “twinned crystal.” Large gems cut from good-color twinned crystals are typically shallow, and should be judged on their overall beauty rather than on proportions alone. The fashioned spinel is from Sri Lanka, while the rough crystals are from Myanmar. The second crystal from the right is an octahedron. The other crystals rotated during growth and appear flattened. Scientists call them twinned crystals. The spinel used in jewelry is a small part of a group of minerals that share the same crystal structure. Not all of them form transparent crystals suitable for jewelry use, however. Spinel offers a range of hues, from orange to intense “stoplight” red, vibrant pink, and all shades of purple, blue, and violet through bluish green.Intense reds and pinks are caused by traces of chromium. The higher the chromium content, the stronger the red hue. Orange and purple stones owe their color to a mixture of iron and chromium. Spinel comes in beautiful red, pink, purple, and blue colors. Violet to blue spinel can be colored by trace amounts of iron, and vibrant blues owe their saturated color to trace amounts of cobalt. The famous 14th century Black Prince’s Ruby in the British Imperial Crown is actually a red spinel. Mineralogist Jean Baptiste Louis Rome de Lisle identifies spinel as a different mineral than ruby. 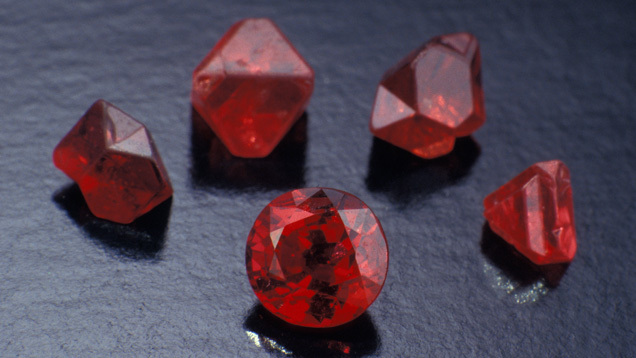 Singly refractive and often very transparent, red spinel rivals ruby’s color but it costs much less. Red spinel is colored by chromium, the same trace element that colors ruby and emerald. Distinguishing spinel from ruby gave birth to the science of gemology. Spinel with no visible inclusions is preferred. The more prominent the inclusions, the less valuable the gem. 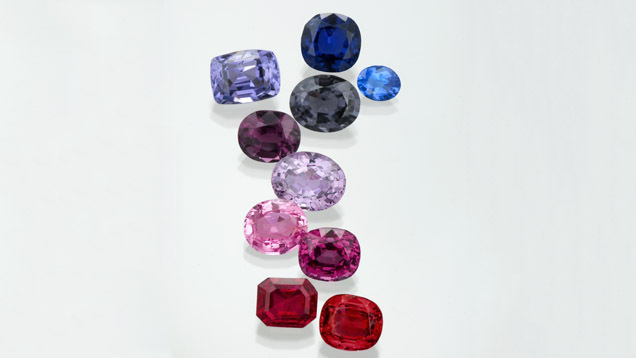 Spinel is most often cut in cushion and oval shapes. When properly proportioned it has excellent brilliance. Fine-color spinel is rare above five carats. Most fine-quality rough is cut to non-standard sizes to save weight.